Viewable 9 a.m. to 5 p.m. Closed weekends and holidays. 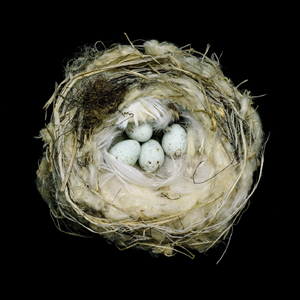 Photographer Sharon Beals writes, "Bird nests, even without knowing which birds constructed them, seem hardly possible." Beals' imagery draws our attention to the architecture of bird nests, which are often constructed of such peculiar combinations of material as spider webbing, caterpillar cocoon, plant down, mud, sticks and twigs, hair and fur, mosses, lichen, feathers, and other found objects. The specimens, collected over the last two centuries, were photographed at The California Academy of Sciences; the Museum of Vertebrate Zoology at the University of California, Berkeley; the Western Foundation of Vertebrate Zoology in Camarillo, California; and the Cornell University Museum of Vertebrates. While few nests are collected today, these nests and eggs are used for research, providing important information about their builder's habitats, DNA, diseases and other survival issues. With a straightforward approach, Beals photographs each nest on a rich black background that allows viewers to appreciate the aesthetic qualities of the structures as both sculptures and natural artifacts. Raised in Seattle and based in San Francisco, Beals' other photographic projects address environmental concerns such as habitat restoration, plastic in the ocean, and the ecology of rivers. Her work has been exhibited at the Strybring Arboretum in Golden Gate Park, the California Academy of Sciences, and the Museum of Vertebrate Zoology, as well as appearing in such publications as Audubon, Scientific American, and American Photo.